Handmade Thai Red and Black Cotton Shoulder Bag, "Dramatic Thai"
Thai artisan Jiap Rojjana designs this dramatic shoulder bag. Made from 100% cotton, the bag features a traditional Thai design in black and red. Black cotton lining and a zip pocket are on the inside of the bag, which closes with a coconut shell button. The strap can be conveniently adjusted by retying the knot at the desired length. 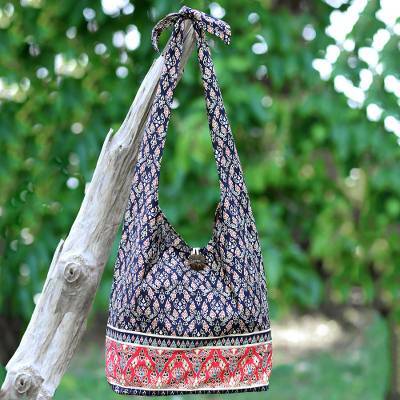 You can find cotton shoulder bag 'Dramatic Thai' by Jiap Rojjana in handbags categories such as Cotton Handbags, Coconut Shell Handbags and Shoulder Bags Handbags. Enjoy exploring these sections for other Novica treasures. This bag is very well made and will handle all things I want to cary in it. Plus it is beautiful. I expect it will last a long time. Thank You Jiap.. For the bags.. You do great work.. Always great comments about my bags.. The colors are beautiful.. Just.. A good expression of color &life.. Thank you..